The independent journalistic platform Innovation Origins focuses on innovation, the business of innovation and the people behind it. Stories that determine tomorrow’s society. Every 4 weeks, Frisdenkers brings a story about a ‘Fris Denker’ (Innovative Thinker), a ‘Changemaker’. This edition: Harmen van Heist, co-founder of Rural Spark. Click the photo below to read the full story about Harmen and Rural Spark. The Marketing Webslog 'MarketingFacts' features an article on Rural Spark and it's endavour to provide people with Acces to Electricity. It focusses on our vision where we build toward a network in which users share energy surpluses to make the network reliable. Co-Founder Evan focusses on the importance of distributed energy-networks to provide an answer to the increasing demand for energy worldwide. "We have to realise current centralised solutions won't suffice for generations to come. Instead of central powerplants, more and more people get their energy directly from their neighbours. We facilitate this already in developing countries, so they can leapfrog the centralised solutions." "It's time to move beyond centralised power plants, people more and more generate their own energy. Not only in the Netherlands, but everywhere. Evan Mertens, co-founder at Rural Spark, speaks about the Rural Spark router, how we can leapfrog centralised networks in developing markets, and how the energy sector is developing in general"
Sit down and relax for a 30 minutes interview with co-founder Evan Mertens at Top Names, a show by Fast Moving Targets. March 10 2018 - With the Netherlands joining the International Solar Alliance (ISA), projects for solar will be stimulated. The Dutch 'Financieel Dagblad' and Dutch Embassy in India feature Rural Spark as an example for bringing smart solutions to connect rural areas. Happy to cooperate with ISA and actually make it happen, because smart solutions are the real way forward for reliable access to clean, safe and sustainable energy. February 9th 2017. The Indian newspaper 'Indian Express' publishes an article on 'Three Dutch ‘energy entrepreneurs’ help villages harness solar power'. After speaking at NID-Ahmedabad’s design symposium, “Design Driven Entrepreneurship”, Evan talked to the paper. Find the full article via this link. The latest edition of Brabant Magazine, #25, features Harmen telling about Rural Spark's activities in Rural India, introducing the new kit. The whole article (in Dutch) can be found following this link: Brabant Magazine Economy Section or by clicking through the print-screens below. For Inclusive Business Accelerator, Nicolas Chevrollier wrote an article on the BoP market. The base of the global economic pyramid (BoP) comprises 4 billion people and represents a $5 trillion USD market opportunity. Both corporates and entrepreneurs recognize this large and growing opportunity. Both struggle to realize it. Corporate Impact Venturing allows them to complement each others weaknesses and reinforce their strengths. Together, they can reach the scale that is required to close the massive service delivery and income opportunity gaps at the BoP. One of the Dutch largest lotteries is using its profit for investment in new innovative companies and supports development projects. In this months mailing, which is sent to the whole of Netherlands, Rural Spark was mentioned. Stichting DOEN (Doen Foundation) published the December 2015 edition of their Bijvoorbeeldboekjes (Example booklets). These booklets contain example projects supported by Stichting Doen. Click the link below for the article on Rural Spark and the whole booklet. 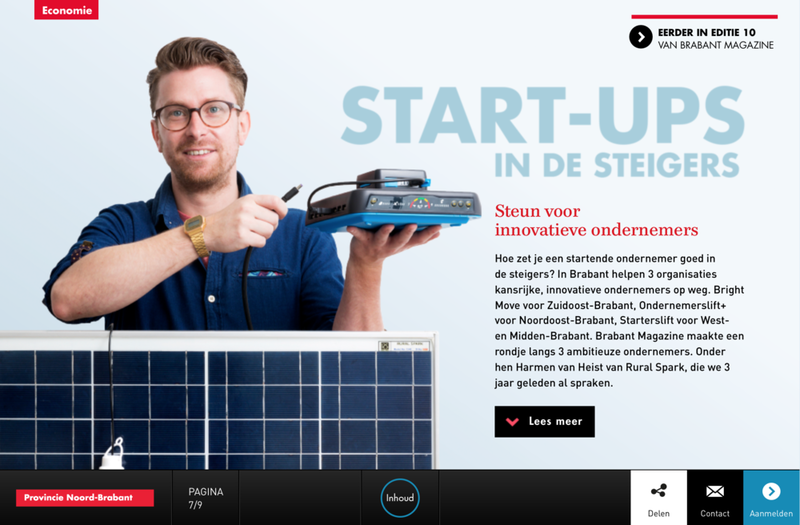 The magazine Vice Versa (Dutch) wrote an article on companies working on energy access for people in rural India. In this article multiple models are described, of which one is the rental model implemented by Rural Spark. Click the link below to read the article (in Dutch). BNR Duurzaam (A Dutch 'all day news' radio channel) featured a short interview with Rural Spark today in BNR Duurzaam (BNR Sustainable). Before Rural Spark, the program talked with André Jurjus, director of the Dutch Distribution network operators about what is needed to innovate energy grids. Rural Spark was asked to tell how 'we are already doing this today' in India. Click in the player above to listen to the interview, or listen to the whole broadcast below (in Dutch).